Q plate - indeterminate vintage. Bought for �00 from a Land Rover specialist in Cleveland. Not exactly in the same condition as it had come out of the Army! Previous owner had carefully painted the "Landie" pillar box red (with a brush), with subtle white 8 spoke wheels and white wheel arches. It was generally in good nick, although the remould tyres gave up the ghost on the journey down the M1. The Land Rover had some interesting features. These included headlights that were less powerful than candles, a speedo needle that had so much bounce that 30mph could have been anything between 0 and 60mph, and steering best described as 'vague'. It had no fuel gauge, you just lifted the drivers seat and removed the fuel tank lid and peered in. Fuel economy was never a strong spot - you were lucky if you got more than 100 miles from the 10 gallon tank. Could have been something to do with the carburettor bearing the name "Ford". It was great fun to drive, especially in the summer with the roof removed. It had lost it's springing on the gear lever, so whilst Reverse was easy to find (all the way to the left), and 3rd/4th (all the way to the right), I was the only person who could ever find 1st and 2nd (somewhere in the middle). 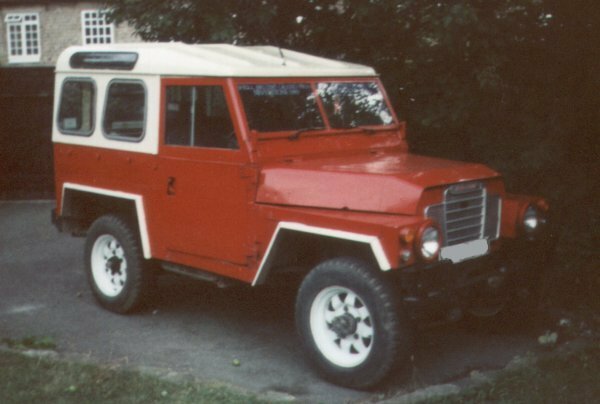 I eventually sold the Land Rover in September 1992. It failed the MOT, and needed quite a lot of work which was probably fairly easy, but I didn't feel like doing. Also, I had three other cars at the time, which was a bit excessive as I only used to use one at a time. I got �00 for it, which was pretty good value in the end.